They used to play in my orchard. I’m pleased to see you again. They are for the forests. Like flames bouncing between the trees. For my measure is to ignite, inspire and bring happiness. And this is you kakariki. About as week ago I noticed no link to an informative site about kakariki on the poll…well no informative links for any of the birds being polled…just another meaningless blog that does very little or nothing to promote or inform about our native birds, and at best promote Forest and Bird Staff names. Most of the polled birds also have very good informative web sites devoted to them… but not used or linked. Emailed politely Forest and Bird regarding this a week ago… (before this blog and many others where established) Never had a courtesy of reply….suggested http://www.kakariki.net, and why. It is NZ based, been around for may yrs, a very strong membership within NZ and overseas, and is #1 on all English speaking search engines , if not for non English, then in the top 5 listed. The NZ Dept of Conservation refers people to kakariki.net for in depth information. From this one can realize that this post is not to promote kakariki.net, or sour grapes we dont need or have to. What the poll and links are and should be about is informative awareness about each bird, right?…. Phil Bilbrough, yes has been campaigning very well on social networking eites for votes, Goggle him and one finds he specializes in marketing on social networking sites, a very narrow medium when it comes to real information on such subjects as native birds, Networking sites by nature are not very informative ..rather social chit chat instead. Here is a picture of red crown Kakariki from one of the handful of breeders NZ. Yes the video above is amusing, but why not do ones homework and have a pure breed red crown? Not an illegal (in NZ ) hybrid species cross, and I believe a kakariki pet from a member at kakariki.net in the UK, where kakariki can be kept as pets… again illegal in NZ… giving a very wrong impression. Kakariki.net and other polled bird web sires is about credible , informed information and promotion of our native birds. We see the annual forest and Bird poll as an important part of that and have promoted Forest and Bird and their poll for may yrs now. This yr the polling methods leave much to be desired, open to abuse, and has been treated as a frivolous game rather than being a credible poll.. Such slap happy poll security (Im not going to elaborate in this post but it very obvious abuse has and is taking place. ), links to blogs that say nothing constructive, other than promote Forest and Bird Staff names, pics that are not representative to show the bird, do nothing for poll credibility and reflects on Forest and Bird unfairly. I hope next yrs poll is going to be better thought thru, more professional, secure and like polls in previous yrs. Kakariki are virtually unknown of in NZ compared to near all other native species (well know oversea as there are more between Iceland and Peru than the whole of NZ, in captivity and wild… Our children keep budgies anywhere else in the world they can and do keep kakariki.. a far superior bird, far more character, and far better pets, and one of the most hardy of birds. Also to note kakariki where kept by early settles on their front porch, and one of the most common in our bush towns etc….like sparrows and thrushes are today. Its all about our birds… not the people. A pretty little green parrot that in the 1870’s came in great flock’s. By the 1880’s the early settlers regarded the Kakariki as a scourge, destroying grain crop’s and invading orchard’s. The parakeets were shot almost to extinction. By the 1890’s they were all but gone. Destruction of lowland forest and predation by rats and stoats have made the Kakariki almost unknown to most New Zealander’s. Kakariki are tuff little energy pack’s but have declined and now extinct in most part’s of New Zealand. With the help of some good people Kakariki have been saved from a terrible fate, extinction. These days Kakariki only survive in the wild, on Stewart Island, Matiu/Somes. Islands in the Hauraki gulf are home to good numbers of Kakariki. Kakariki seen in Mainland forests will likely never see old age and may end their day’s in the jaw’s of a stoat. This is a sad fact. From great flock’s their numbers are reduced to only tiny group’s, sometime only a single bird. At places like Willowbank, Orana Park and the aviaries in Invercargill Kakariki can be seen. Wellington and Auckland Zoos have some. There are probably Kakariki in aviaries near your home. Go take a look at these great little Kiwi bird’s. Oh those lil green parrots can sure cheat! Do you think the Kakariki voting has corporate backing, as in other contenders and past winners?. Probably not. Does the Kakariki have a greater population than the Pukeko or perhaps even the Kiwi?. Probably not. Is there any other endangered NZ Native bird of genetic purity that is bred, housed and kept disease free, then killed by private individuals?. Probably not. Is there any other NZ Native bird that potentially has a greater population overseas than in NZ?. Probably not. Is there any other NZ Native bird that has had such a large population decline in such a short period. Probably not. Is it long overdue for the word on Kakariki to be heard; for the disregard, apathy and unenlightened attitude of those that should no better?. Definitely yes. Red Sector – would you please explain this statement to me? 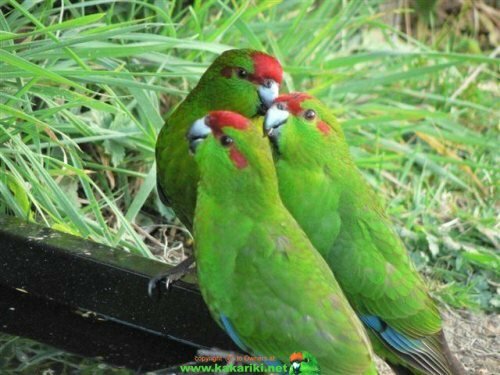 Kakariki in captivity are easily managed and readily breed, they have little to no monetary value and are regarded by most aviculturists as a “give away bird”. If mixed sexes are housed together and nesting sites are available there will soon be an excess of young. Other than removing eggs which will result in potentially draining the hen as she will carry on laying again and again then most often the only thing to do is dispatch young birds before or when they fledge. The preferred method is to decapitate with secateurs. I hope this clarifies any “questionable statements” I may have made. And welcome any further queries/discussion. Yes We have been doing this for many years….I have holes all thru our gardens with now 100s of heathy kakarki culled cause DoC will not allow then to be released. But one can raise phesant, release on a farm, fill a form in post it off, for shooting season next yr. This yr we have about 20 chicks in nests and weaned, If homes cant be found, or some conservation project ‘cant’ take them…snip…and its not just kakariki, its weka reptiles, many species. Why cause thats the law in NZ according to DoC. I have the utmost respect for DoC people who get their boots dirty, the deskjockeys is another story. http://www.kakariki.net there is a search funtion on the left hand side…serious about finding out about kakariki use it….post if have any questions, you have the top kakariki experianced breeders fro all around the world. And the Auckland Zoo are from our stock…last time I saw them was not too please as to how they where kept and they did not look as good as they should. Kakariki are more known over seas than in NZ…sort of like a lorro is known in NZ. then did another when the mayoal votes had fiished…One of the Hamilton candiates had a puke for a logo /theme.. these votes stoped once results where in but the kakariki kept going up. Red Sector…Do ?I know you thru the kakariki netwrk?.. i know or know off most of the breeders in NZ…..contact me please? ‘contact web master link top left on http://www.kakariki.net. There is no excuse for any hybrids to be in NZ….as far as Im concerned hybrids just need to be destoried…The internal Affairs (pre DoC ) had a policy to granfather out going back tto at least the 1960s…today there are still hybrids and records of a retired inpector from the late 1960s thru to the 1960s showed they where still around. For the last 7 yrs of strong independant campaining, information, edcation through kakariki.net, there is very little hybrid stock left…well I havnrt seen any for several yrs now. Also several of us have made huge efforts to have stock avalible to replace hybrid in capitivity. Note A big difference between a hybrid and a mutation, something that was very common in the old wild stocks pre eraddication in the 1800s. We now have very little natural mutaions in our NZ stock…Te settlers shot , the mutations captured and exported, more wild flocks shot, then the few that remained the fermin took care of. WHY cannot surplus capitive kakarki that are going to be killed anyway, be released in city reserves, Albert Park in the CBD….see what happens? Oh thats right DoC desk jockeys. Note here…The good grass roots guys in DoC can think what is riight, but cant say…they risk promtion and their jobs. Call a spade a spade and a shovell a shovel…. There is no good reason why kakariki are not in our backyards. digging along side the thrushes. The whole issue is not just kakariki,t goes way beyond to most of our repiles, and endangered birds. Goodness Red Sector, that is terrible, dreadful 🙁 Ugh. Why can these birds not be released? What is the reasoning by DoC? Why don’t you just release them and ignore DoC? These are birds in our aviary here in Nelson. I’m sure you’ll agree they have a lot of energy and personality. They look quite neat, I think you’ll agree. One female is a little tatty although has been a very hard working mum and had just raised a bunch of young ones, when the video was made. I really hope you enjoy the video clip, and maybe, just maybe take a shine to these little cheat’s. They only cheat a little bit. The rest of the time they are simply too busy having fun. Sadly the stoat’s dashing about the bush are also having their kind of fun. But we won;t go there in these notes. I hope you find find it in your heart to vote for Kakariki next year. Then there is “but they will be killed by vermin” so where is the research to back that up? Why are the populations down by Wellington and Shakespear Bay surving? tDoC doesnt admit it but they where illegel releases as where most of the scattered populations thru NZ. Again Im very anti this practice unles they are pure breed. 2. when throwing stones one makes sure ones own house is sqweeky clean, and if that means after chopping of the head of birds that one has carefully raised, looked after, and ones family just leave one alone in silence for a while in a quite peaceful cnr of the garden…..So be it. They have been hanging around there as far back as the 1920s that I know of..several flocks from Pakari hills to Warkworth…just watch..the transloction tthat took place last yr into that area will be credited to the expansion of the populations by DoC, just as several other populations will be and have been..
Can this conversation be taken into the F & B chatroom where more people might add to it… tis an interesting one and I would like to learn more. DoC uses excuse of Beack and feather disease….its in the wild anyway, its not known if actually effects our native species…they can have many kakariki as they like to find out. and our kakariki stock was DNA checked by DoC, plus a whole range of other diseases…Clean on intial and 2nd back up check. DoC uses excuse that they will be killed not survive…how do they know, they havnt tried, and the other species have been quite sucessful…Have offered them kakariki to experimenr with. DoC says it doesnt have the budget, kakariki are a very low prioty….The facities are already avalable… the people breeding are already very experianced and trained. and prepared to volunteer their time. But they are prepared to spend thousands of dollars on nets, helicopters, staff , time to tranlocate a hand full of kakariki with age, fertility, health, purity unconfirmed….and with rather high death from strees rate….which I believe is simply because they would not take the advice of breeders in NZ and Aussie who are expeianced, regularly ship kakariki perth to Sydney, 36 hrs + in very different cages…..but hey what the hell would we know right?